The North Dakota Legislative Higher Education Committee, which includes State Sen. Ray Holmberg, R-Grand Forks (third from right) and panel chair, State Rep. Mark Sanford, R-Grand Forks (first from right), met on the UND campus June 5 to discuss research at UND and NDSU and how to fund it. Holmberg chairs the Higher Education Funding Committee in the Senate, while Sanford heads up the House committee on funding higher education. Photo by Connor Murphy/UND Today. Most everyone agrees that research investments benefit North Dakota and its people. 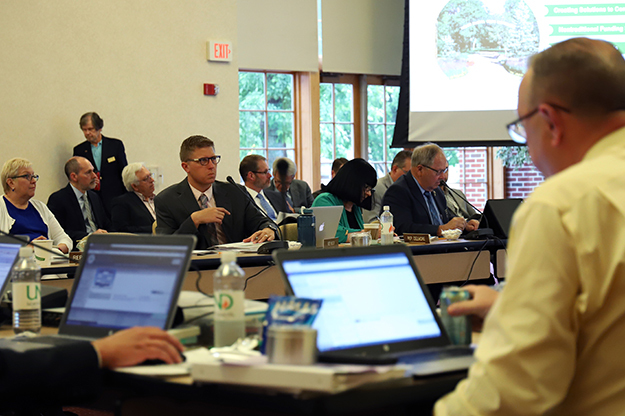 How to obtain and distribute those dollars – and how much the research universities collaborate – was a matter of discussion at the Legislative Higher Education Committee meeting Tuesday, June 5, on campus. 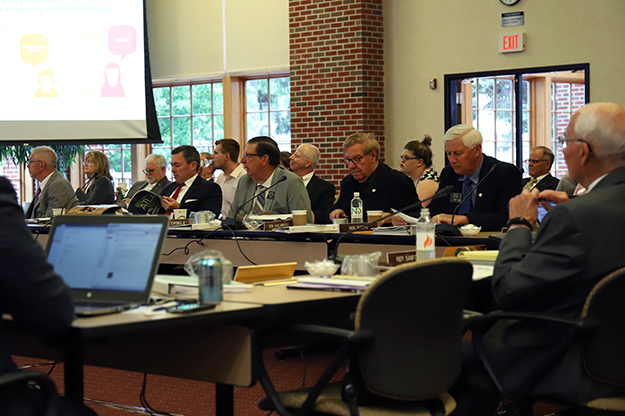 The legislators met Monday at Mayville State University to discuss financial and other issues. Tuesday’s focus was research at UND and NDSU and how to fund it. Legislators frequently queried presenters, asking about cooperation between institutions, measuring research results, funding and more. UND and NDSU do cooperate in research and other areas, said presenters, who mentioned a joint biomedical engineering degree, ND EPSCoR and a project to produce ammonia that involves the UND EERC, UND chemistry, and NDSU researchers. 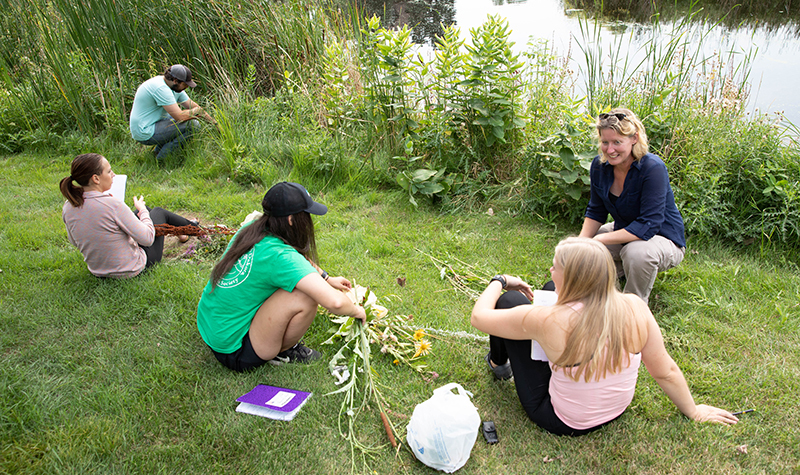 The research landscape has changed, said Kelly Rusch, vice president for research and creative activity at NDSU, in her presentation, which focused on that institution’s strategic plan and three grand challenges: food systems, healthy population and sustainable energy. She said that although federal funding has decreased, research is vital to serve the needs of the state. “We have a vast need for research in the state,” Rusch said, citing cancer, diabetes, agriculture and energy. Grant McGimpsey, UND vice president for research and economic development, also focused on UND’s Strategic Plan and five Grand Challenges in his presentation. He invited each grand challenge champion to speak briefly about their work and how it benefits North Dakota. Legislators asked about the clinical research Grand Challenge, which focuses on applied research to find out and address why, for example, North Dakota has increased colon cancer risk compared to other states. 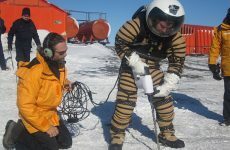 Colin Combs, Chester Fritz Distinguished Professor of Biomedical Sciences and champion of that Grand Challenge, said they are looking at everything from water sources to lifestyle. They also asked several questions about tackling addiction, a Grand Challenge led by Thomasine Heitkamp, professor in the College of Nursing & Professional Disciplines. They wanted to know about federal funding, rural challenges, workforce, family issues and more. “We can capture more federal funding,” said Heitkamp, who said they are working to integrate substance abuse, mental health and primary care to help families. “We have been very successful at building teams to help communities.” Heitkamp detailed the extent of the problem, which also includes alcohol and methamphetamine in addition to opioids, and affects both families and the work force. State Rep. Cory Mock, D-Grand Forks, assistant House minority leader, addresses members of the Legislative Higher Education Committee on June 5. The committee heard a number of presentations about university system research, and focused many of their questions on cooperation between UND and NDSU. Photo by Connor Murphy/UND Today. Jay Schuler, Director of the Department of Commerce, gave a presentation that focused on obtaining research dollars from the private sector rather than federal and state funding, which is declining. Schuler said the Department of Commerce is interested in university intellectual property and commercializing technology at universities, which he said could increase research and revenue as well as create jobs. Schuler introduced a consultant who provided her rankings of NDSU and UND, and cited NDSU’s ag research and UND’s EERC as examples of successful tech transfer. Legislators noted that the successes for each university have entirely different funding models, ag research with a long-term reliable investment from federal and other sources, and EERC is entrepreneurial. Representatives from Valley Prosperity Partnership (VPP) gave a presentation to support investment in an emerging technology fund that encourages collaboration between universities and business. They also advocated more decision-making independence for research universities to better address workforce and research needs of the private sector. “Universities play a role in innovation, productivity and education,” said Steve Burian, VPP co-chair and CEO of Advanced Engineering & Environmental Services. He cited a recent state survey which revealed that voters believe the universities can attract new business and create new jobs. Legislators asked if the group is working with Gov. Burgum and the State Board of Higher Education and were assured they had met with the chancellor and governor. Mark Hagerott, chancellor of the North Dakota University System, spoke briefly about the need for research to meet state needs.